You should have Node and npm installed on your machine. A basic understanding of Angular and Node is required. Sentiment analysis is a way to evaluate written or spoken language to determine if the expression is favorable, unfavorable, or neutral, and to what degree. You can read up about it here. Live comments offer a realtime comment experience that doesn’t require a page refresh. You see comments when they’re posted. Using Angular, you can extend the template language with your components and use a wide array of existing components. With Pusher we can enable realtime messaging in the chat using Pusher’s pub/sub pattern. 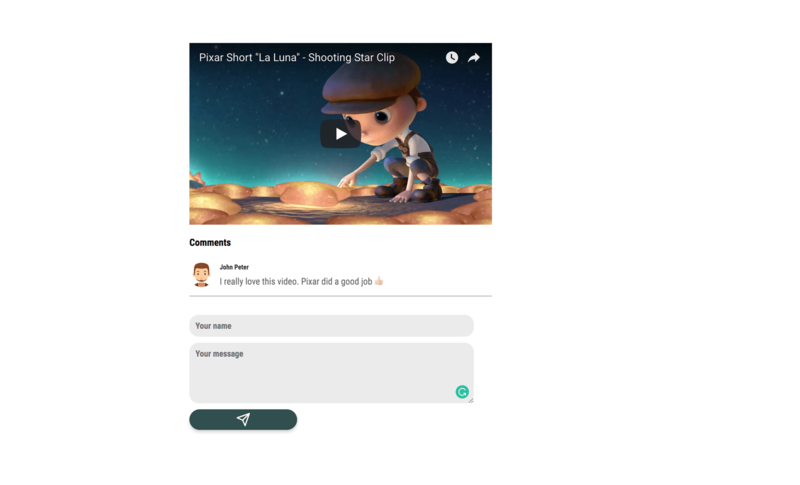 We’ll be building a live comments application using Pusher, Angular and the sentiment library for emoji suggestions based on the context of messages received. Using our application, admin users can view how videos are rated based on the analysis of the messages sent in the live comments section. To follow this tutorial a basic understanding of Angular and Node.js is required. Please ensure that you have Node and npm installed before you begin. We’ll be sending messages to the server, then using Pusher’s pub/sub pattern, we’ll listen and receive messages in realtime. To make use of Pusher you’ll have to create an account here. After account creation, visit the dashboard. Click Create new Channels app, fill out the details, click Create my app, and make a note of the details on the App Keys tab. Using the Angular CLI (command line interface) provided by the Angular team, we’ll initialize our project. To initialize the project, first, install the CLI by running npm install @angular/cli in your terminal. NPM is a package manager used for installing packages. It will be available on your PC if you have Node installed. The command tells the CLI to create a new project called angular-live-comments, use the CSS pre-processor SCSS rather than CSS for styling and set up routing for the application. Open a terminal inside the project folder and start the application by running ng serve or npm start. Open your browser and visit http://localhost:4200. What you see should be identical to the screenshot below. 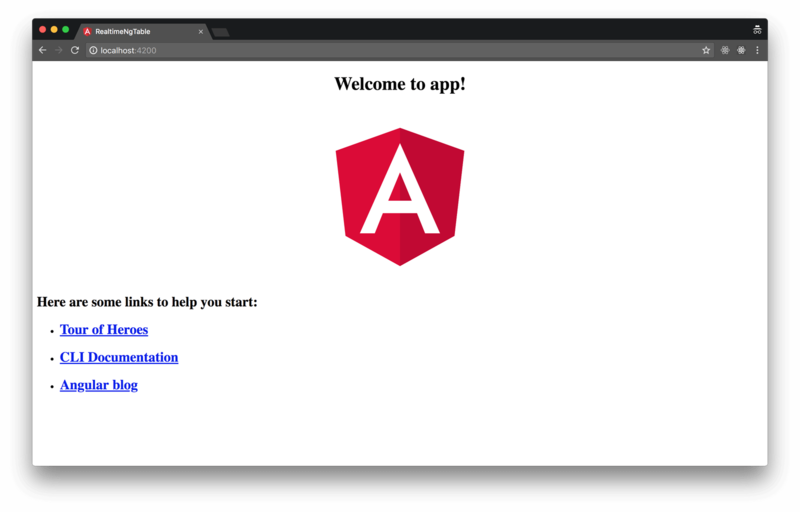 Now that we have our Angular application running, let’s build out a part of our server. To do this we’ll need to install Express. Express is a fast, unopinionated, minimalist web framework for Node.js. We’ll use this to receive requests from our Angular application. To install express, run npm install express in a terminal in the root folder of your project. We referenced three packages that haven’t been installed, body-parser, pusher and dotenv. Install these packages by running the following command in your terminal. body-parser is a package used to parse incoming request bodies in a middleware before your handlers, available under the req.body property. dotenv is a zero-dependency module that loads environment variables from a .env file into [process.env](https://nodejs.org/docs/latest/api/process.html#process_process_env). This package is used to avoid adding sensitive information like the appId and secret into our codebase directly. The dotenv package will load the variables provided in our .env file into our environment. CORS: The calls to our endpoint will be coming in from a different origin. Therefore we need to make sure we include the CORS headers (Access-Control-Allow-Origin). If you are unfamiliar with the concept of CORS headers, you can find more information here. The dotenv library should always be initialized at the start of our file because we need to load the variables as early as possible to make them available throughout the application. Let’s create a .env file to load the variables we’ll be needing into the Node environment. Create the file in the root folder of your project and update it with the code below. Please ensure you replace the placeholder values above with your Pusher appId, key and secret. This is a standard Node application configuration, nothing specific to our app. To enable users to send and receive messages, we’ll create a route to handle incoming requests. Update your server.js file with the code below. We created a POST /messages route which, when hit, triggers a Pusher event. We used object destructuring to get the body of the request, we also got the text and name in the request body sent by the user. The data object contains the text and name sent by the user. It also includes a timestamp. The trigger method which takes a trigger identifier, we included a list of channels because we wish to dispatch the event across two channels(chat, rate). The trigger function also takes a second argument, the event name (message), and a payload(data). We still go ahead to respond with an object containing the data variable we created. Using sentiment analysis, we’ll analyze the messages sent to determine the attitude of the sender. With the data gotten from the analysis, we’ll determine the emojis to suggest to the user. We’ll update our POST /messages route to include analysis of the messages being sent in. Update your server.js with the code below. Include the sentiment library in the project. result: here, we analyze the message sent in by the user to determine the context of the message. comparative: this is the comparative score gotten after analyzing the message. A new property (score) is added to the response data containing the message’s score after analysis. You can now start the server by running node server.js in a terminal in the root folder of the project. Let’s begin to build out our chat interface. We’ll create a chat component to hold the chat interface. We’ll create this using the CLI. Run ng generate component chat in a terminal in the root folder of your project. We have a form containing an input element, a textarea and a submit button. We are using an icon-set called feather-icons in our project. To include feather-icons in your project, simply add the cdn link in your index.html file. sendMessage: this method uses the native HttpClient to make requests to the server. The POST method takes a URL and the request body as parameters. We then append the data returned to the array of messages. In the ngOnInit lifecycle, we initialize [feather](https://feathericons.com), our chosen icon set. Let’s create the home component, this will house (pun intended) our chat component, video and list of messages. Run ng generate component home in a terminal in the root folder of your project. Open the home.component.html file and replace the contents with the snippet below. <iframe width="500" height="300" src="https://www.youtube.com/embed/7CVtTOpgSyY" frameborder="0" allow="autoplay; encrypted-media"
Note: you can find the assets used throughout the article in the GitHub repo. So far we have an application that allows users send in comments, but these comments are only visible to the sender. We’ll include the Pusher library in our application to enable realtime features like seeing comments as they come in without having to refresh the page. We’ll add the library as a third party script to be loaded by Angular CLI. CLI config is always stored in the .angular-cli.json file. Modify the scripts property to include the link to pusher.min.js. Now that Pusher has been made available in our project, we’ll create a Pusher service to be used application wide. The Angular CLI can aid in the service creation. Open a terminal in your project’s root folder and run the following command. This command simply tells the CLI to generate a service named pusher. Now open the pusher.service.ts file and update it with the code below. First, we initialize Pusher in the constructor. The init subscribes to the channel passed as a parameter. Note: ensure you replace the PUSHER_KEY string with your actual Pusher key. To make the service available application wide, import it into the module file. We’ll make use of this service in our component, by binding to the message event and appending the returned message into the list of messages. This will be done in the ngOnInit lifecycle in the home.component.ts file. To enable routing between the home and admin page, we’ll define routes for each component in the app-routing.module.ts file. routes: previously, the routes variable was an empty array, but we’ve updated it to include two objects containing our route component and path. Whenever we post a video, we want to be able to tell how the video was perceived by users using their comments on the video. Sentiment analysis is used to achieve this. 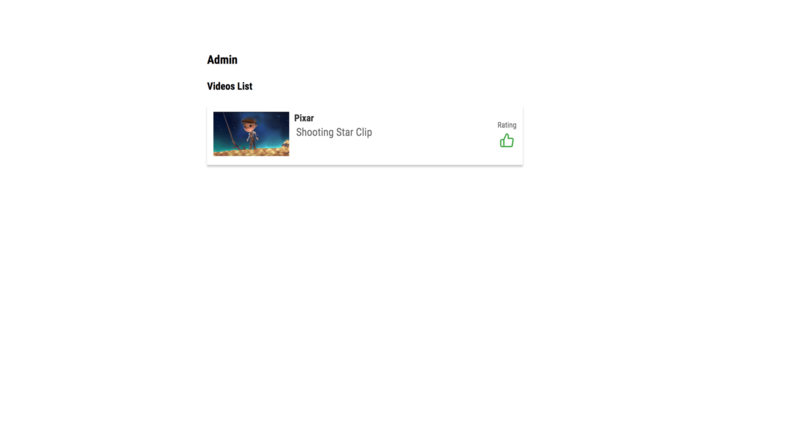 All comments under the video will be analyzed to determine the user’s attitude towards the video. All videos posted will be rated based on the tone of every comment posted. If the comments under a video are mostly negative, the video will get a simple thumbs down(👎🏼) and a thumbs up(👍🏼) if the comments are positive. To create the admin page, run ng generate component admin in a terminal in the root folder of your project. Replace the contents of the admin.component.html file with the snippet below. Note: all assets used are available in the repo here. We have the thumbs up and thumbs down icons, we display thumbs up if the rating is one and above. Thumbs down is displayed when the video rating is below one. The rating property will be defined in the admin.component.ts file below. Add the styles below to the admin.component.scss file. rating: starting out, every video has a rating of 1. In the ngOnInit lifecycle, we initialize feather and subscribe to the rate channel. We then listen for a message event. In the callback, the score property of the data returned is added to the rating property. There’s not much going on here, but now our admin page rates videos in realtime whenever there’s a new comment. Here’s a screenshot of both pages side by side. Using the sentiment analysis library, we can rate videos on our site by analyzing the comments posted under the videos. 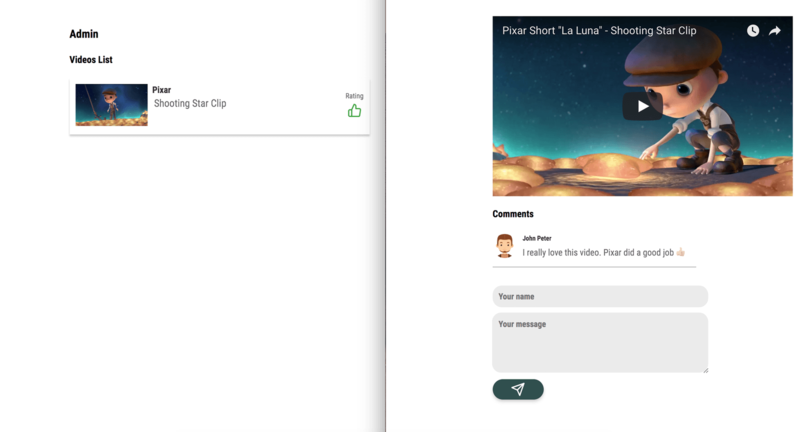 Using Pusher Channels, we were able to implement live comments functionality in our application. You can view the source code for the demo here.